Biking4Breasts is a 2000km bike ride, run on Zwift through Wahoo smart trainers (static bikes). The one twist is that we are going to attempt this distance over 24hrs. Why are we going to do that? To raise awareness regarding the signs of breast cancer, and to fund the latest in breast cancer models for use across a range of training and education settings. I’ve done quite a lot of shouting about biking for breasts. One issue is that I’m not the most…concise of people at times. So with 10 days to go before the event this post is going to act as, “the whole story” to Biking4Breasts; where it came from, and what I hope the outcome will be. I graduated from Warwick University Medical School in 2010, and have been loosely associated with the university since then. In 2014 I landed one of my dream jobs, an extension to my GP training, meaning that I get to spend half of the week teaching at the medical school, half in the GP practice – sweet! One of my roles is the ensure that the first years have a good grounding in the basics of clinical examination – basically where to put, and NOT put the stethoscope. One of the examinations that we teach is the breast examination. A very important examination, and one that I labour at over every year, stressing as the commonest cancer to affect women, being able to do this examination correctly you may save a life. 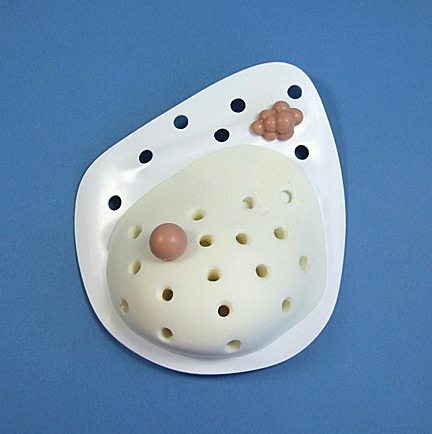 The examination is taught and in almost all educational settings is performed on prosthetic breasts. There is just too much actually going on in the models to be of discerning use. Now lets take those same models to a college, or a health promotion day with the general public. For medical students, these can be very good models, but to the untrained, they just kind of feel like bean bags, with a few marbles added inside as well. The point is they are NOT representative of a usual cancerous, or more importantly EARLY cancerous breast. So there is little educational value to the public in this model. In order to catch cancer earlier, you need to have people, the general public, recognise the signs of cancer earlier. If you image breast cancer as a fire, you want people to recognise SMOKE before the fire really gets going. Similarly we WANT people (I’m not just saying women there, as breast cancer can also affect men) to recognise the subtle signs, a change in breast tissue, a new, small lump that MIGHT mean something sinister, so they come and get checked. i) That person will be sent for further investigation, which might mean catching a tumour earlier, and saving a life. It also might mean less radical treatment, where the patient only has minor surgery, rather than needing a full removal of the breast. ii) We can say that the earlier 19 women did the RIGHT thing. Heck even thank them! Thank them as their coming in, NORMALISES going to the doctor get check a small worry looked at. Which in turn allows MORE women to come along to the doctor “just to get checked”, meaning we are more likely to find that 20th person, who nearly didnt come. I’ve seen that 20th person who didnt come in. That lady who wasn’t sure, so didnt want to trouble anyone. That lady who thought that slightly thicker area was nothing. That lady who waited too long. The solution – as it is for many things is education – but even at a medical school, as with the model above. Its tough. That model is basically all about FIRE. No subtly. No smoke. These are not just any breast models, they are Marks and Spencer breast models (That joke might note translate over the Atlantic), to put it a different way, these are the Rolls Royce of Breast examination models. The reason being if the demonstrator decides WHICH breast cancer signs go under the silicon. Underneath the silicon breast is a mounting are where you can choose which signs or tumours to put in the breast, and more importantly WHERE in the breast. There are 6 lump types – so less than the other breasts, but with much greater SUBTLY to them. By raising money for these breast models we will be able to loan them out to local schools and colleges, plus adult education centres. Have them available for use by cancer research and cancer awareness charities, such as the CoppaFeel and Pink Ribbon charities. These models will help people realise what the SMOKE feels like in the breast, which will mean we will hopefully see more women in GP surgeries to get their breasts checked. 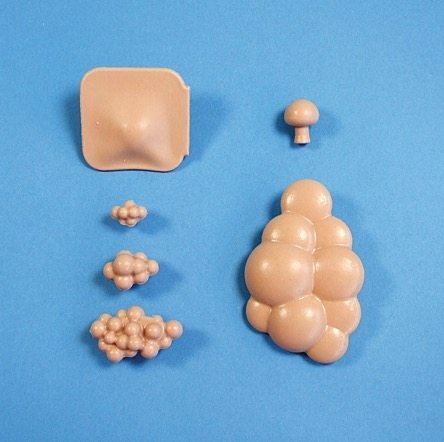 We will also be able to use these breast models to upskill medical professionals, and students. Many practitioners are more than aware of the risks and signs of breast cancer, but further, more detailed, more granular training opportunities will never be turned down. By having these available to future general practice trainees, we will also be up-skilling the people the patients will be coming to see, thus trying to tacking the problem at both ends of the patient/doctor equation. 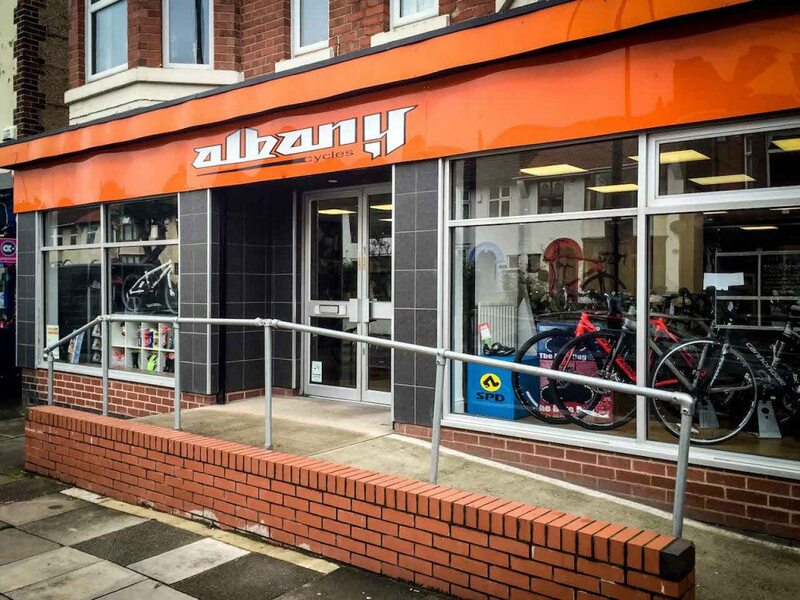 We want to buy 10 units – each at £880 before tax! By raising this money through a charity, if any groups want to use them, they will be able to. The more people who can get access to these models the better, the more informed and aware people will be to the signs of EARLY breast cancer. If we raise the £10,000 needed, and loan these models out throughout the Warwickshire county, and we get ONE person to think, “Hold on, I dont have a lump, but my left breast does feel a little like that model” and she goes to see her doctor to get checked, this WHOLE endeavour will be worth while. RIGHT! I’ll get off my soap box now! On with the fun and games, literally. So whats going on Oct 14th?? 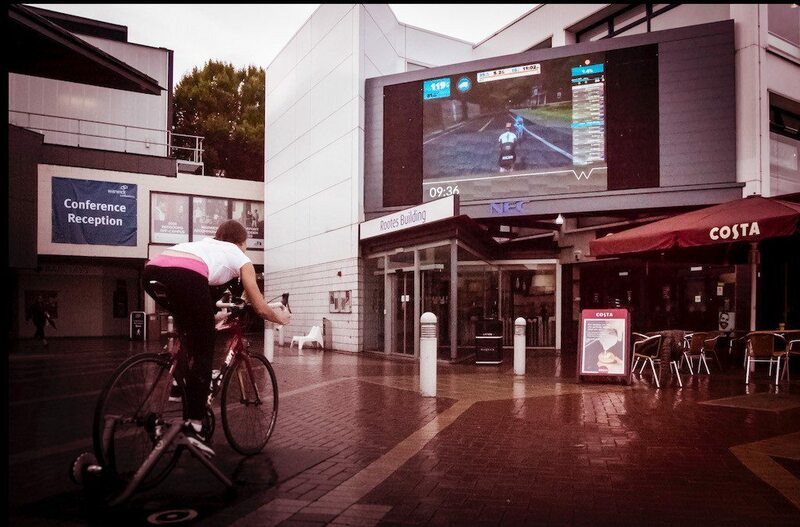 Zwift, the online, cycling simulator are coming to Warwick to help support Biking4Breasts. 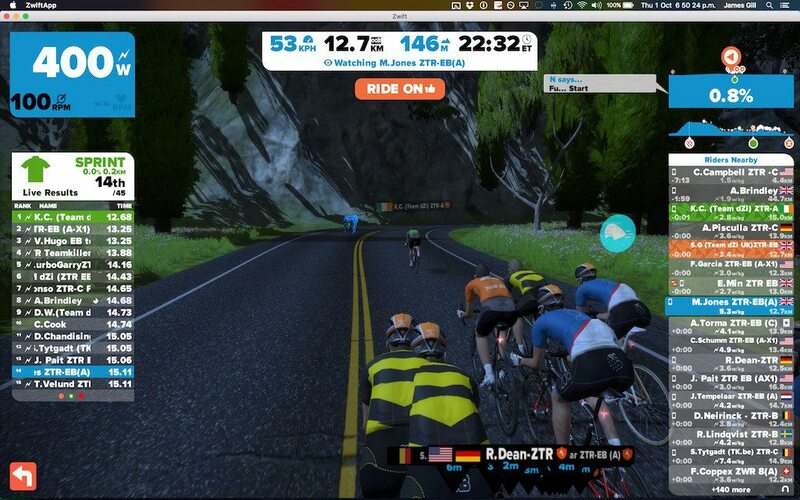 Zwift is a cycling simulation, like you’ve never seen before! Zwift have been exceptionally generous and will be providing us with the equipment for 5 racing setups. You can see 2 used previously. These bikes, will be directly racing on the screens as you can see above. Its so realistic, occasionally I’ve found myself leaning for the corners! Our very damp tech demo! We’ll be starting the ride, at approximately 9am, and will continue through to get our total milage. The bikes will be running all day and night, so the kilometres will be added from all 6 bikes to the total. 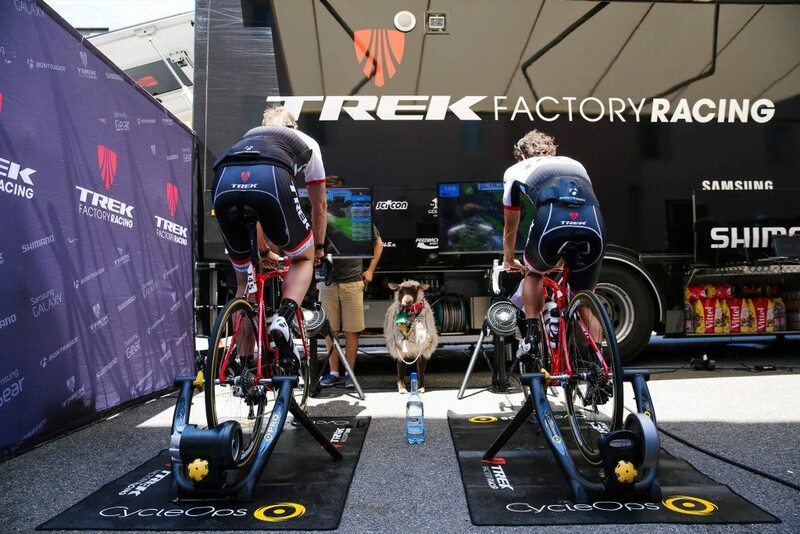 If you want to come drop by and give us a spin with your legs, we’d encourage you to. All the bikes will be fitting with flat pedals, so you can just jump on. 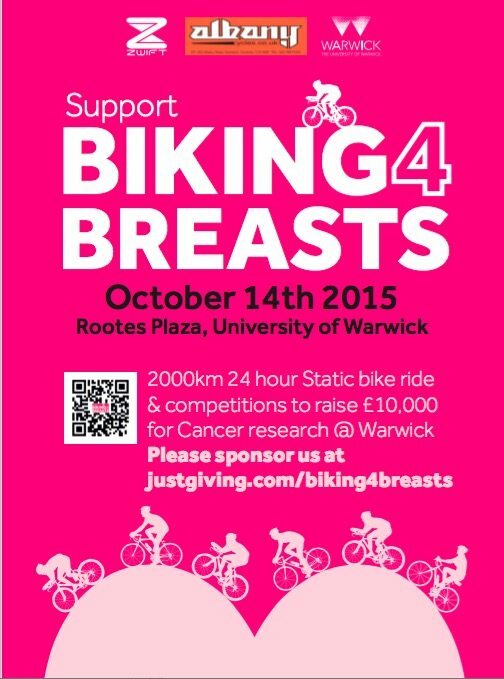 BIKING4Breasts – COMING TO WARWICK UNIVERSITY OCTOBER 14TH – BRING A FRIEND AND FRESH LEGS!